The One Show Children in Need rickshaw challenge team. An annual rickshaw challenge being held as part of BBC Children in Need sets off on its journey to London from the Borders this time round. One Show presenter Matt Baker and children will pedal out of the town at about 5am on Friday morning from outside Jedburgh Abbey, heading south for a 62-mile ride to Newcastle, with the public welcome to cheer them on at their departure. To prepare for the launch event, Abbey Place, Abbey Bridge End and the town hall car park will be closed to vehicles from 9am on Thursday to 8am on Friday. In addition, a no-waiting restriction will be in force in Abbey Close, where a small number of members of the public will be able to get a limited view of the filming within the abbey on Thursday. The abbey will close to the public at its normal last entry time of 3.30pm. 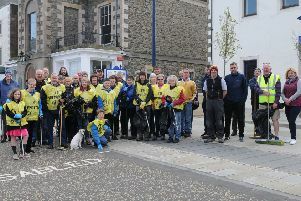 Tweeddale East councillor Graham Garvie, convener of Scottish Borders Council, said: “I am delighted to welcome Pudsey, Matt and the children taking part in this year’s rickshaw challenge to the Borders and wish them all the very best for their week of cycling and fundraising. This year, the rickshaw will once again be pedalled by six young riders, all of whom have been supported by BBC Children in Need-funded projects. This is the sixth year the rickshaw challenge has been run, and it has raised more than £12m so far. The young riders will test their pedal power and their mettle as they deliver speeches to a live audience, explaining their motivations for taking in the challenge as they cycle their way down the east coast, heading for the finishing line in London on Friday, November 18, in time for the BBC Children in Need Appeal Show.